The V-Fit MCCT-1 2-in-1 Cycle Cross Trainer is the brand’s take on this multifunctional exercise machine. 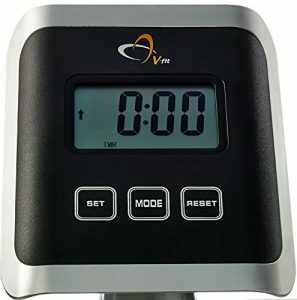 V-Fit is known for its budget-friendly fitness products such as treadmills, exercise bike, and cross trainers, but this time, they have combined two machines in one – for an affordable price. This type of equipment doesn’t only help you save money from buying the two separately, but it also reduces the space occupied in your house. If you want to know more about this hybrid cross trainer, you’ve come to the right place because everything you need to know is right here. The V-Fit MCCT-1 2-in-1 Cycle Cross Trainer may be offered at an affordable price, but its quality hasn’t been compromised. It’s made of a robust tubular steel frame with a chip resistant finish that will make it last a long time. 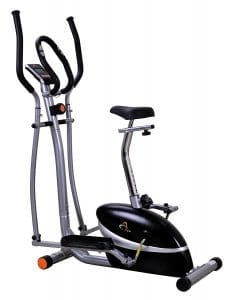 This machine has a silent magnetic flywheel that weighs 4.5 kg, and it can support a maximum user weight of 110kg, making it excellent for weight loss and achieving other fitness goals. With this multi-functional equipment, you can do various workouts without having to switch machines. Unlike treadmills where your stride depends on the length of the machine, this type of fitness machine doesn’t restrict your movements. The V-Fit MCCT-1 2-in-1 Cycle Cross Trainer can be altered to suit your shape and size perfectly with its height adjustable large padded saddle and oversized non-slip footplates. It also features eight magnetic resistance levels which can be adjusted with the knob that can easily be accessed by the user. These resistance levels are suitable for various fitness levels, from beginners to advance users, to boost cardiovascular health and stamina as well as promoting muscle growth. 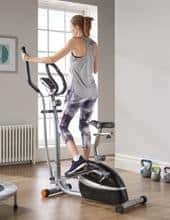 The magnetic technology allows the machine to operate quietly while providing you with a smooth ride either on the cross trainer or exercise bike. 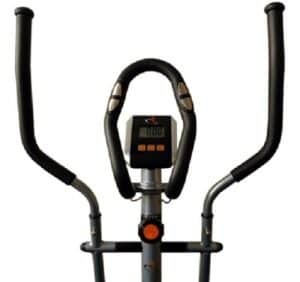 Aside from the swinging handlebars that allow you to shape and tone the muscles in your arms, the V-Fit MCCT-1 2-in-1 Cycle Cross Trainer also features a fixed central safety handle. The stationary handlebars come with integrated pulse sensors which help you monitor your heart rate. In this way, you’ll be able to determine whether your workout is effective or not. 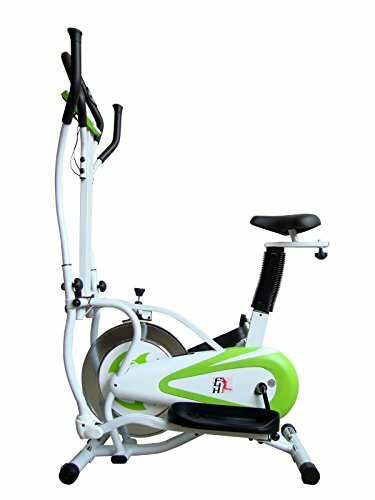 Since this is a multi-functional fitness machine, you can use both handlebars while standing when using it as a cross trainer or when seated when using it as an exercise bike. As an entry-level fitness machine that’s suitable for beginners, the exercise monitor on the V-Fit MCCT-1 2-in-1 Cycle Cross Trainer is relatively simple and easy to understand. It has seven functions as it can read theoretical calorie burn, distance, hand pulse readings, odometer, scan, speed and time. The machine doesn’t require any power supply to work, but the monitor is battery-operated. This will help you keep track of your progress to make sure your efforts are being paid off. Putting things together is a frustrating task for a lot of people, and a manual comes handy when you’re not really good at it. Sadly, the instructions that come with the V-Fit MCCT-1 2-in-1 Cycle Cross Trainer are quite difficult to understand. However, even if you’re not an expert, this fitness equipment is said to be easy to assemble. You can probably seek for some help, and you’ll be able to build the machine in no time. 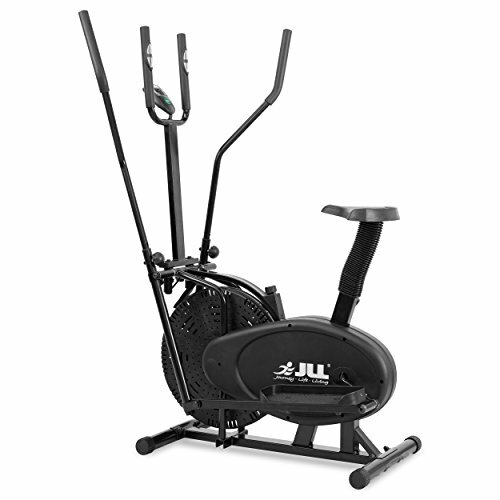 The JLL 2-in-1 Elliptical Cross Trainer Exercise Bike CT100 is another multifunctional fitness machine that’s even offered at a more affordable price. It’s made of a durable steel frame that can support a maximum user weight of up to 110kg. For a long-lasting and sleek looking finish, it’s also covered with a powder coated paint. This cross trainer bike is direct chain driven, so it gives you the authentic feeling of riding an outdoor bike. It has a resistance dial, but there are no specific levels set when you want to make your workout more intense. The tension dial loosens or tightens the tough band that’s wrapped around the flywheel, so you have total control over how much resistance you want to incorporate. JLL 2-in-1 Elliptical Cross Trainer Exercise Bike CT100 Detailed Review? CLICK HERE. You won’t run out of choices when it comes to this kind of exercise machine. The FIT4HOME Olympic 11 Cross Trainer Bike is a similar equipment that can fit into the most limited spaces and it’s highly affordable. It can support a maximum user weight of 250 pounds so various people in your house can use the machine. 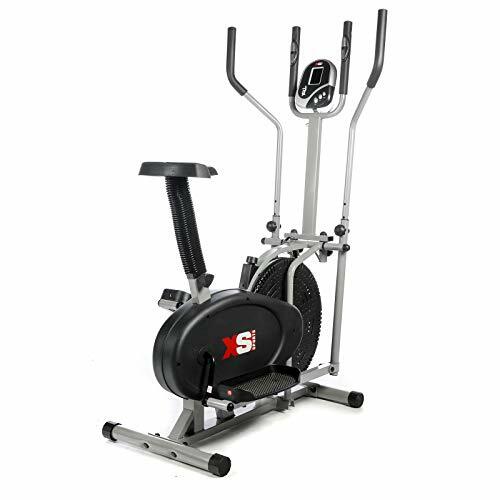 The flywheel incorporated into this cross trainer bike is comparable with more expensive models as it weighs 6kg, making it suitable for novice and intermediate users. FIT4HOME Olympic 11 Cross Trainer Bike Detailed Review? CLICK HERE. When it comes to cross trainer bikes, the XS Sports Pro 2-in-1 Elliptical Cross Trainer remains as the number one bestseller. It has a maximum user capacity of 110kg, and it won’t hurt your savings as it’s budget-friendly. This multifunctional equipment comes with built-in pulse sensors and adjustable resistance to add intensity to your workout. With wide foot pedals that can fit up to a maximum of size 12 (UK size), it can be used by multiple users such as your other family members. 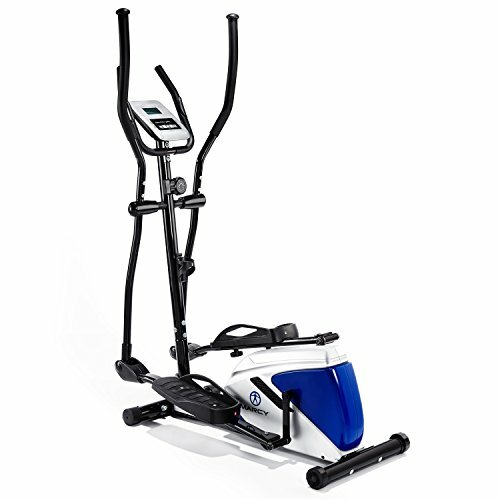 The Marcy Azure EL1016 Cross Trainer is purely a cross trainer, and it has a 4kg flywheel with eight resistance levels. It has oversized slip-resistant feet and a 14-inch stride which can accommodate even tall users. This cross trainer comes with a built-in smartphone or tablet holder which allows you to watch a movie or keep yourself entertained while working out. It can support a maximum user weight of 110kg, and it comes with a promising guarantee of 2-year warranty on frame and parts. Marcy Azure EL1016 Cross Trainer Detailed Review? CLICK HERE. The V-Fit MCCT-1 2-in-1 Cycle Cross Trainer is a versatile machine that has a smooth and quiet magnetic flywheel resistance system. This multifunctional machine provides you with both a cross trainer and an exercise cycle in a compact and space saving design. It doesn’t offer any advanced features, but its simplicity makes it attractive to the novice users.